Well another month has gone and we have had plenty of rain which has knocked the bowls about a bit. On Sunday, 19th August we had the Woopi Wanderers return visit (we visited them 3 months ago). Even though the weather was miserable they still came up and we had a BBQ brunch and a few beers while watching the rain. They departed at 1.30. The Father’s Day bowls was a great day with 2 greens full of bowlers. To mention a few raffle winners: Barry Mallett won the TV and Ron Bull the hose reel, heaps of other great prizes were won by happy Fathers. Robin Montague won an electric whipper snipper only thing is he has no grass to cut. Tuesday, 4th September we had a visit from the Redcliffe BC, because of rain the game was called off after 9 ends, winners for the day were John Forshaw, P Windahl and A Windahl. The Motor Neurone Disease Charity Day raised over $9000. The bowling club paid $1600 for a Eastern Suburbs footy jumper donated by the legend Artie Beetson. It celebrates 100 years of Easts Footy Club and is signed by the 2007 players. Junior Roundup with Terry Sheen. When one coaches a young boy for over twelve months and sees very little progress, you start to think to yourself, “I must be doing something wrong”, when suddenly his progress is startling. This young lad suddenly starts drawing shots on either hand. I am not going to tell you his name, but with conditioning of his body, we will have another junior boy in the ranks of Evans Head Bowling Club. (He knows who he is). Young Luke Jones is coming along very well and is now playing shots with weight to disturb the head. The two Cselka girls are going to South Tweed Heads Bowling Club to contest the fourteen and under and the eighteen years and under Pairs Tournament. They will go alright in this tournament. We will be having another junior day at Evans Head on the 7th October with a form of consistency singles one of the attractions, 9.15am, $3 for bbq lunch, no charge for bowls, adults $5 for lunch. Any parent who wishes their child to play Lawn Bowls should get in touch with myself on 6682 6162 or the Club and arrangements will be made to coach them on a Saturday morning. B Lee, P Wernicke defeated A Cselka, J Rodda 21 to 14. Cselka and Rodda got off to a flying start only to be caught up and overtaken - looks like 14 is not their lucky number. Lucky Phil and Barb going on to win 22 to 14. Joan and Ron Fernance went down to Alice and Col Peel 30 to 11. Stefanie Cselka and Glen Pobje could not get the better of Jean Deuchar and John Lang, the game was close up until the last few ends with Langy and Jean going on to win 26 to 14. On one end a Langy comment was heard by Jean and they exchanged a few words needless to say Langy came out second best. A great comeback was made by Merle and Eric Swanson against Pauline McCarthy and Teddles with the Swanson’s winning the last 3 ends to score a great win 23 to 20. Look out Eric, you may have to hit the wallet again for a new pair of bowls trousers!. Lucky Phil and Barb Lee had a great win against Bev and Robin Montague 26 to 10 with the game finishing on the 18th end. Phil has been playing his drives very well of late and should go on to win this championship. Terry Sheen and Trudy Sparrow got off to a very good start against Shaine and John Crosby, the Crosby’s finished well winning 12 of the last 18 ends winning the game 21 to 14. The Foxes went out to play, Norm and Mavis that is, they had a good win against Joan and Barry O’Keefe 23 to 11. Norm concentrate more on bowls than blowing your horn, Beep Beep Norm!. Amanda, Stefanie and Steve Cselka with Terry Sheen had a hard fought win against Larry Sandford, Betty Chandler and Maryanne and Peter Carey 25 to 19, this was a very close game right down to the last end. Alice and Col Peel with Bev and Robin Montague had a comfortable win against Tony Dance, Vicki Hart and Joan and Barry O’Keefe 24 to 5. The Swanson duo teamed with Carol and Jimmy Thomas to have a very good win against Norm and Mavis Fox and Shaine and John Crosby, coming back from 11 to 4 down. The Thomas, Swanson team really kicked into gear to record a win of 20 to 17. Jean Deuchar, Barry Mallett, Sue Downs and John Lang had a good win against Bev and Robin Montague, Col and Alice Peel 23 to 13. The score does not reflect the game because up until the 16th end it was anyone’s game and luck favoured Langs team in the last 5 ends. Ted Butler, Rod Greetree, Owen Dorey and John Lang beat a team from Pottsville 29 to 19 and in the afternoon while it was raining for the entire game we beat Maclean 21 to 14. They are now the Zone Champions and will be off to play in the state titles in October, well done men from everyone at the Bowlo and good luck!. The 16 team sqaud went off to Sydney and sadly did not win. A squad of sixteen players which included Ted Butler & John Lang, and two officials traveled down on Thursday 6th Sept. Friday afternoon we played the strong Zone 12, at on stage we were 53 all but eventually went down 87 to 72. The second game was against Zone 11 which we ended up winning 77 to 73, game three was against Zone 3 which we led early on 40 to 10 but fortune did not favour us and we ended up going down 98 to 81. Hey guys Evans Head is still very proud of you. A Word from President Jack. The outdoor smoking Terrace has now been completed and furnished, allowing our smoking members to have a puff in comfort. I would like to thank Michael Robson and all the other Trades people for an excellent job. Many clubs have had a downturn in turnover since the onset of the new smoking regulations, luckily our turnover has improved. The Directors and management are planning future developments and expansion of the club to cater for our 3500 members and the many visitors. At this time the club is progressing extremely well. 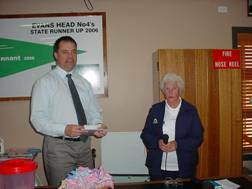 Councillor Ray Jeffery, the Mayor of Evans Head, was given the honour of drawing the lucky winner, and after playing with the balls (all 193 of them, as 7 did not sell) the lucky number 67 which belonged to Vic and Irene Bunker was drawn. Well Ray being a man of many talents had one more ball to draw from the barrel; lucky number 173 for $1000 worth of fuel went to Vince and Shirley Parr. We thank Ray for drawing two balls from the barrel and to all the others who bought tickets, a big thank you. 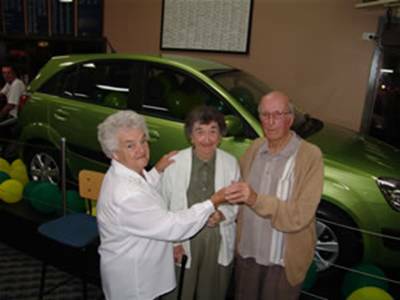 Vic and Irene turned up at the Bowlo on Sunday for the official handover of their prize; Marie White on the left presented the lucky couple with the keys to a brand spanking new KIA Rio. Vince and Shirley Parr were also presented with the $1000 fuel voucher; this will keep the Buicks going for a while, and the Austin as well. On Wednesday the 1st July the Evans Head Women’s Bowling Club (EHWBC) had their charity day which raised $3100 for the Westpac Rescue Helicopter. President Yvonne Marsden presenting the cheque to Tony Goodwin. People do not realise how important this helicopter service is to the community until the day that you have to use it. My wife, Tania, would not be here today if it wasn’t for this service back in 1994, well done ladies. 23rd September, Seagulls Social Club, 1pm start, mixed. Till next month keep your bowls close to the kitty.